LIstening to music is something that I find myself wanting to to quite often. I have a fairly large music collection with different types of music depending on my mood. Ubuntu 13.04 makes it easy to manage my music collection and listen to the music that I am in the mood for. This Post will show you two applications that you can use on Ubuntu to manage and listen to music. 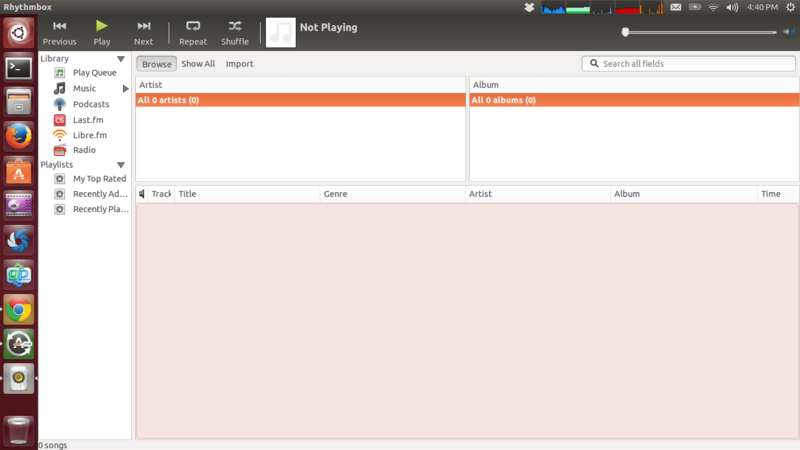 The first application is Rhythmbox which is the default music player on Ubuntu 13.04. Rhythmbox can play your CDs or even rip them to your music library so that your music collection will be fully digital to make playback easier. Rhythmbox will automatically connect to the Internet and retrieve information about the CDs you are playing so that you will have the names of artists and songs along with the CD artwork for each file. Rhythmbox has the ability to play Internet Radio and Last.fm This is another great feature that Rhythmbox brings to your computer by default. Internet Radio is a great way to discover new music that you like. Another important feature that Rhythmbox has is the ability to download and play podcasts. Podcasts are audio or video series that someone publishes on a mostly regular basis. Listening to podcasts is a great way to consume content about topics that you select. I recommend that you look through the available podcasts, I guarantee that there is something there that will interest you. Rhythmbox has the ability to manage your iPod also. This can be very important for people with iPods that have made the switch to Linux from Windows. The second application that I will be going over is Banshee. Banshee is not installed in Ubuntu 13.04 by default but can be installed in the Software Center or by running the following command in the Terminal. Banshee is my media player of choice at the time of this writing. Notice that I say at the time of this writing. This is due to Linux constantly changing and new improvements being made daily. Banshee has the ability to do all the things listed above that Rhythmbox can do such as play CDs, rip music to your library, download song information, sync with your iPod, and play Internet Radio and Podcasts. Along with all of this Banshee can also play videos. This makes Banshee a more one stop Entertainment Center. Banshee is also much more actively maintained meaning Banshee will has the potential to support new feature faster and fix bugs quicker. If you have any questions don’t hesitate to leave a comment below. Also, If you found this post helpful please like and share so that other people can find this post more easily.